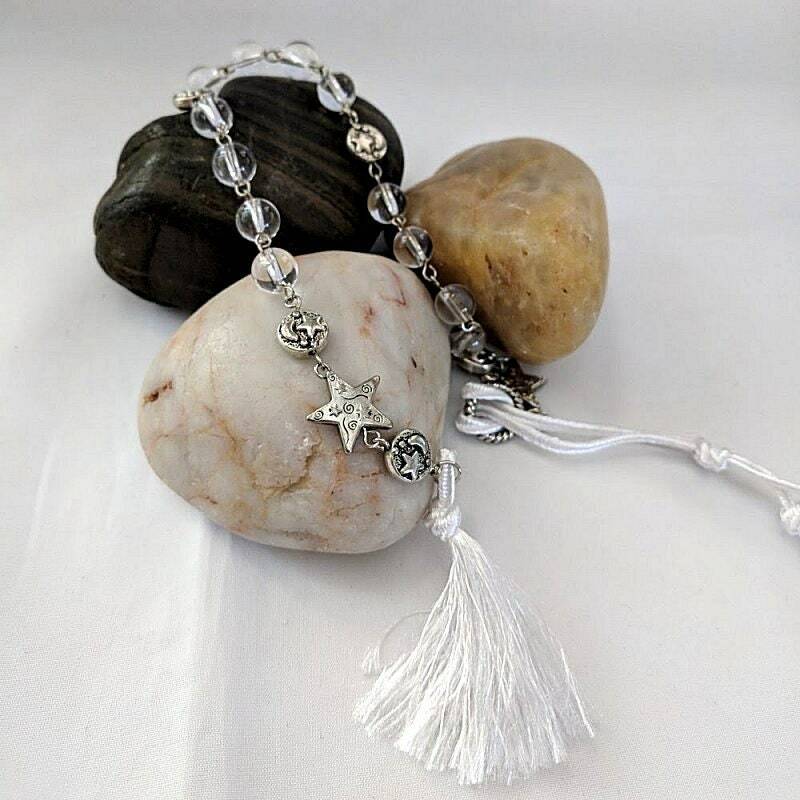 This chaplet has 12 clear quartz crystal aves (one for each star) and is divided into 3 groups of four beads. 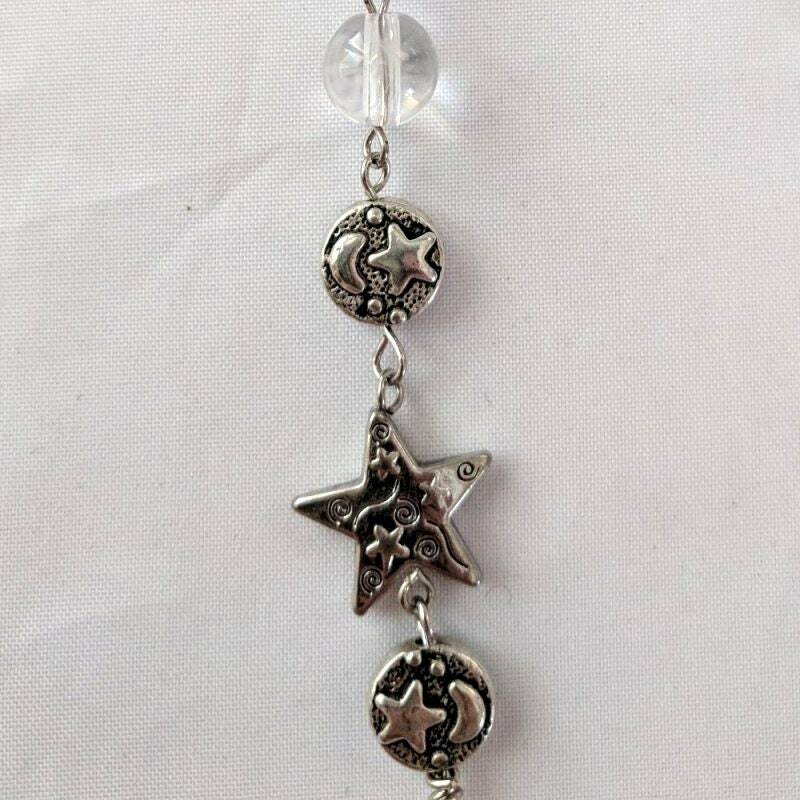 Usually seen as a circular rosary, our version is linear and also has 4 round flat coin beads with the image of a star and moon on each side, serving as paternosters. 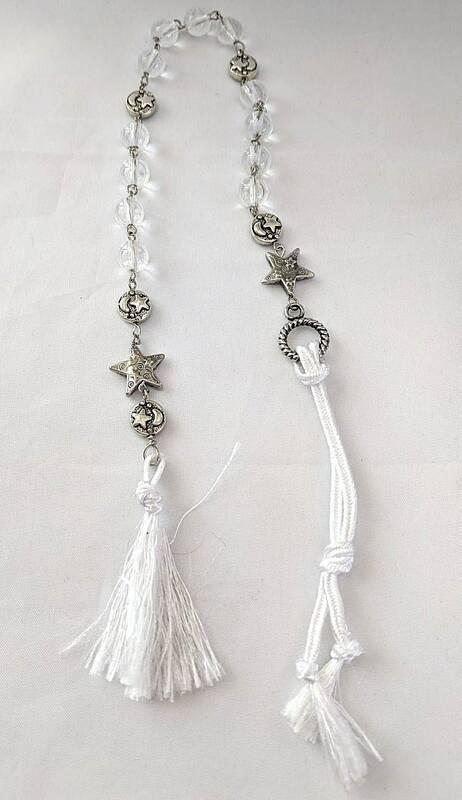 There are also 2 star shaped beads at each end, plus an extra sun and moon bead at the tassel end, making 12 star images as well. A metal ring with a hanging cord is on the other end. Excluding the hanging cord it measures approx. 13" in length. TWELVE STARS DEVOTION - St. John, the beloved disciple of Jesus and Mary, was privileged to behold a wonderful sign in Heaven: "A woman clothed with the sun, and the moon was under her feet, and upon her head a crown of twelve stars." (Revelations 12.1) This gave rise to the Crown of Twelve Stars devotion. St. John Berchmans favored this devotion in the 17th century. CLEAR CRYSTAL - Clear quartz crystal helps to expand consciousness by amplifying energy and thought so that we can move beyond the physical body. 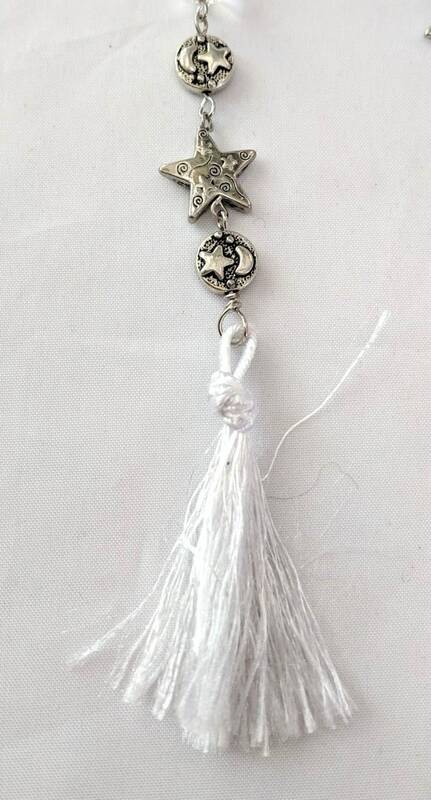 It facilitates open communication and is traditionally connected to the crown chakra and the universe; however, it stimulates all the chakras. For those needing clarity of mind, clear quartz healing properties will eliminate energy blockages and allow energy to flow smoothly throughout the body. Custom Order - This same rosary can be made with wire links for $70 extra. Convo us, if interested.